The photographs are of the lovely piece of young Amber, known as Copal, that measures app. 4.1 x 3.9 cms and weighs app. 7.84 gms. 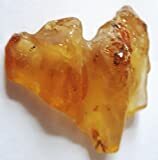 Amber is a fossilised tree sap resin and copal is younger than Amber. This piece has a few tiny inclusions – possible tiny insects or seeds, but there is a slightly bigger inclusion which appears to be a full winged insect. Amber is said to give a soothing, light energy that is both calming and energizing at the same time. Said to help manifest desires and heighten intellectual abilities, Amber gives clarity of thought, and wisdom. It is also reputed to cleanse its environment by drawing out negativity, and to relieve physical pain the same way. A mystic stone which brings patience, protection, psychic shielding, romantic love, sensuality, purification, balance, healing and calmness to those who wear or carry it. Amber is considered a good luck charm for marriage and an excellent crystal healing for inner child work and past life work. Amber is associated with the solar plexus chakra and sometimes the sacral chakra. On a physical level Amber is beneficial for purifying the body, headaches, bone problems, heart problems, circulation, ears, hearing problems, endocrine system, fibromyalgia, intestinal/digestive disorders, kidney, bladder, lungs, and general healing purposes.